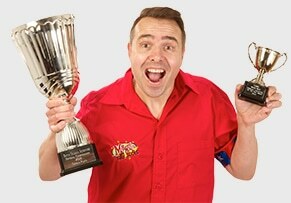 Children's Birthday Party Entertainer Silly Scott Answers all your FAQ! Silly Scott Scott is a Children's Entertainer based in Portsmouth and covers the local area's of Portsmouth, Southampton, Fareham, Gosport, Chichester, Bognor Regis, Petersfield, Winchester, Basingstoke, Throughout Hampshire and some parts of Berkshire, Wiltshire, West Sussex and Surrey. Where can i find reviews for Silly Scott? The best place to find lots of reviews is on Silly Scott's Facebook page, where you will find well over 200 five star reviews. Silly Scott has the most five star reviews than any other children's entertainer in the local area. Scott offers different packages to suit your event, the magic show generally lasts between 30min-45mins and he is able to offer a range of completely different shows for all day events. For birthday parties the most popular time is 2hrs which has a food break half way through. As a typical school class size is between 25/30, so this is normally about right. What age group do you perform for? As my entertainment is a family show then it works for all ages of children generally starting from 3yrs upwards, the mums and dads equally enjoy my show as much as the children. Can you perform your show at our home? Yes, definitely i often perform in houses which sometimes suits shy, quite children or parties with only a few party guests. Scott recommends that if you have over 15 party guests it is much better to hire a local hall so things are not too cramped! Can you perform in my garden? Unfortunately not, as i'm sure your agree most gardens will be a major distraction with swings, slides and other garden toys. Also the weather can be just as much a distraction, being too sunny and not a good idea for children to sit out in for long periods of time, and as they will be sitting on the floor looking up the sun could be in their eyes. Also wasps ect! If you really would like the party at home then a compromise with the show inside and party food break outside works well. It is most definitely best to book the entertainer first as it is much easier to secure a hall than a very popular entertainer like myself and you may have to be flexible with your party date. Just remember that its your entertainer that will predominantly decide the overall success of the party not the venue! After years of being in the children's entertainment business Scott has found that the best times for weekend parties are either 11am-1pm or 3pm-5pm as they both fall over natural lunchtimes and it also frees up the morning or afternoon for party guests and their parents to do something else instead reining their day with a party smack bang in the middle of the day. Can i book a shorter show on the weekend? I only perform my full 2 hour party package during the weekend as these are the busiest days for an entertainer, and once filled i always turn away lots of other enquiries. Shorter shows like 45min or 1hr mini party are only available mid-week. I try to be as fair as possible, being a parent yourself i'm sure you totally understand that this is my full-time job and how i pay my mortgage, bills and support my own family, and i will have also turned away lots of other work for that day to uphold our agreement. So as per the booking contract t&c's if the cancellation is due to illness then i am more than happy to rearrange the party (rescheduled parties will only be offered mid-week after school and not on another weekend date) If however you wish to cancel the booking completely then a cancellation fee will be payable unless i am able to re-fill the date. I am a true professional and if i am ill you will never know as i will still turn up and perform the show without doubt, if however i was hospitalised or had a family emergency then i would then find adequate entertainment in my place so you will not be let down. Can you attend our charity event for free or a reduced fee? As much as i would truly love to help everyone, unfortunately this is just not possible. So each year i offer my services for free to a select few charity/fundraising events close to my own heart. A parking spot directly outside, so I don’t have far to unload my equipment, setting the room correctly is also the secret to a fantastic party. Leave a space at one end of the hall (with a power point easily accessible) for the set up of my show, with tables for the party food at the other end and a line of chairs facing my show in-between. This ensures the children will not have the run of the hall and confine them to the entertainment area, and will give parents a better view of their children and Silly Scott's show which is equally as fun for them too. Also please DO NOT have balloons on the floor as they will be a major distraction, make sure they are all tied securely out the reach of the children. No party blowers or any sort of ‘noise-makers’ which children blow into, trust me after 5 minute you’d wished you hadn’t bought them and the other parents will most certainly be cursing you on the way home!